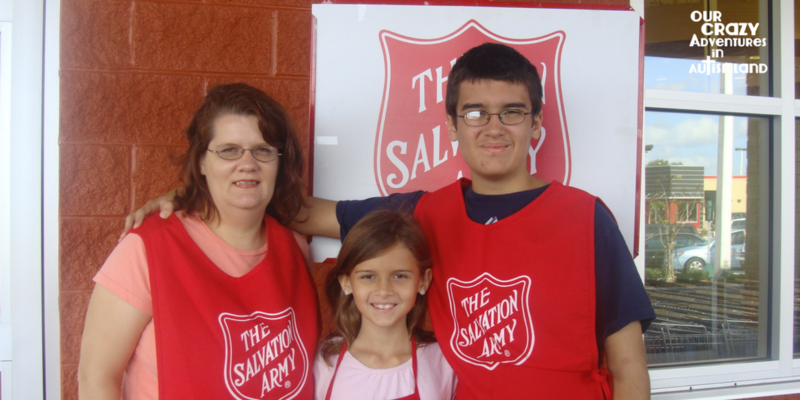 Community service is a crucial part of cultivating a servant’s heart in our children. Autism doesn’t change this character need. Service to others helps teach children that the universe doesn’t revolve around them. There are other people in this world whose situations are far worse than anything they have endured. 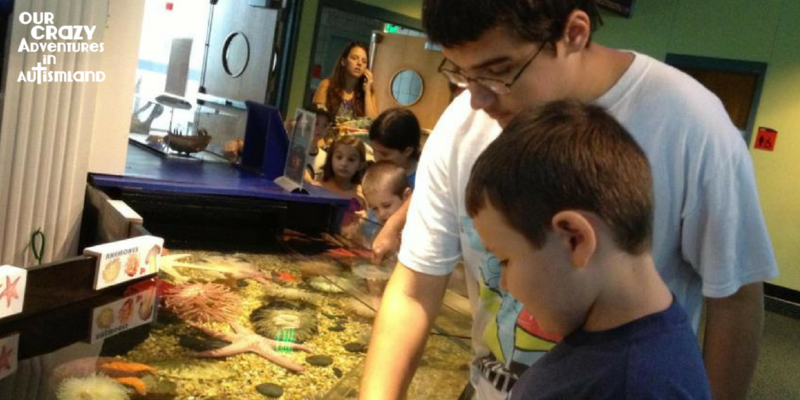 While it’s important to find service opportunities, it is not always easy when you have a child with autism. Of course you will have to take into account any accommodations for your child. I would not help out in a soup kitchen with Logan because the smells and sounds would be too much for him. We could sit with the people to talk but I would have to be beside him modeling appropriate behavior as well as intervening if he goes off on a tangent. Serving the food would be out of the question due to his sensory issues as well as food allergies. This isn’t anything to be distressed about as his mom. Make sure that the job your child gets sets him up for success and have someone who understands him nearby to provide support. Deliver food boxes to the elderly once a month. We did this for 5 years or so. I had to be vigilant in making it work for him. We only did 10 houses. We only stayed for a few minutes if they wanted to talk (most of them did). He got down time when we got home to regroup. Deliver Meals on Wheels for holidays. Lots of time the organization looks for people to take the routes so the regular drivers can have the day off. We fixed them a plate from our own holiday meal then delivered it as a family. It takes no more than an hour which gives Logan enough time to rest and regroup from the family celebration. Depending on his sensory limit, we may let him stay in the car while we do the actual delivery. Visit a nursing home. Read to them. Sing a song. Play an instrument. Play your child’s favorite game with the residents. They are usually so excited to see young people that you could stand on your head and that would make them happy. Pick up groceries for a harried mom that you know. I have been known to call up friends to ask if we can grocery shop for them under the ruse of working with Logan on his life skills. Most people will let you do it because they think they are doing you a favor in return. Make a meal for a family then randomly deliver it. I like to take a freezer meal just in case they already have something out for dinner. Logan gets to practice in the kitchen while doing service as well. But what do you do when there are no service opportunities or you can’t make any of them work for your child? There are going to be times that it won’t work no matter what you do. One time we volunteered at a local homeless shelter helping them sort items for their thrift store. It could have worked out into a continual service opportunity. It didn’t because the woman in charge was extremely rude to Logan. She just saw him as being a lazy teenager who talked too much. In reality, he was someone with poor muscle tone who couldn’t stand for long periods that talked a lot to help regulate. Not unlike herself to be brutally honest. Perhaps that’s why she didn’t like him. What you do isn’t as important as the fact that you do something. Anything. Even if it’s working on holding the door for people at the post office. We want our kids, autism or not, to have servant’s hearts. This world will be a much better place if we teach our kids to think of others before themselves. 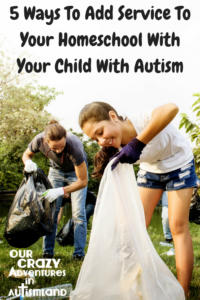 This is not an impossible tasks for our kids with autism. It just takes lots of practice, patience, and time. 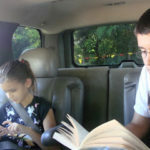 How do you add service to your homeschool with your child with autism?